Countess Winfrey began her dance career at the age of 11. Born and raised in Nashville, TN she began her dance training at Dance with Stacy Dance Studio. She also attended Wharton Arts Magnet School where she majored in Dance and Art. She later went to Nashville School of the Arts where she trained in Bal-let, Jazz, Modern, and African dance. Countess later attended the University of Memphis, and graduated with a Bachelor’s of Science degree in Health and Hu-man Performance and a minor in Dance. She has also participated in a variety of dance festivals including the American Highschool Dance Festival, the Ameri-can College Dance Festival, the American Dance Festival, and the David Dorf-man Dance Winter Intensive. 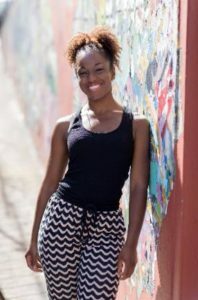 She has danced professionally for the Brown Dance Project, ClancyWorks Dance Company, and is currently dancing for Dayton Contemporary Dance Company.